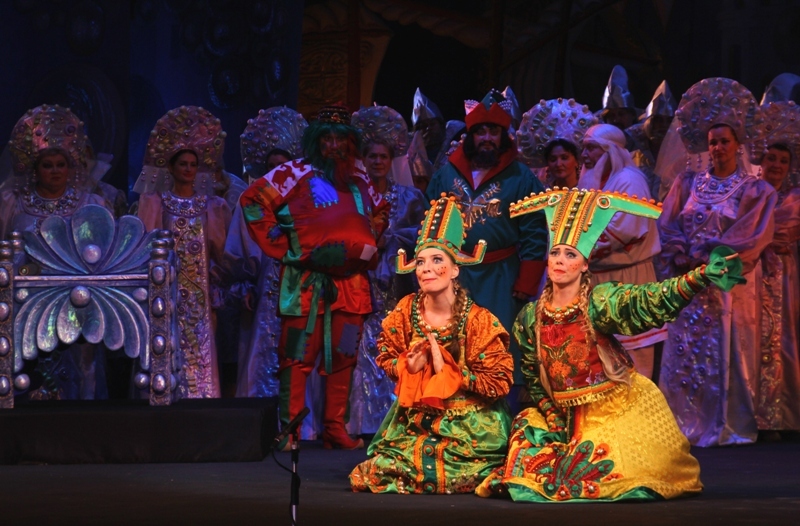 Libretto by V. Belsky based on A. Pushkin’s fairytale. Place: Partly in the city of Tmutarakan and partly on the island of Buyan. On a wintry evening three sisters are sitting at spinning wheels. As Tsar Saltan overhears from outside the door, the oldest sister boasts that, if she were Tsaritsa, she would prepare a sumptuous feast; the middle sister would weave a grand linen; the youngest promises to bear a bogatyr as son for the Tsar. Saltan enters, chooses the third sister to be his bride, and takes her away. 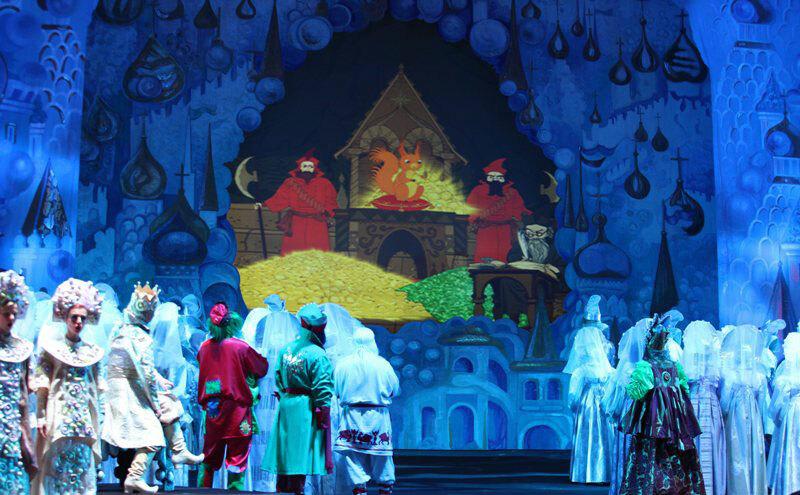 The old woman Babarikha devises a revenge for the two jealous older sisters: when the Tsar is away at war, a message will be sent to him that the child born to his Tsaritsa is not human, but a monster. The Tsar’s departure and farewell, by the Russian artist Ivan Bilibin (1905), corresponds to the Introduction to Act 1, and the first movement of Rimsky-Korsakov’s suite from the opera (1903). The Tsar has gone off to war. In his palace in Tmutarakan, the Tsaritsa has given birth to a son. She is despondent: there is no reply from her husband to the news of the birth of their child. Her sisters, who (with Babarikha) are now part of the court, the older sister as Cook, and the middle sister as Weaver, try to entertain her, as does the skomorokh and the Old Grandfather. They replace the message of the Tsaritsa by another one,which says that she has borne neither a daughter nor a son, neither a mouse nor a frog, but a kind of beast (monster). But all this is to no avail. The young Tsarevich, who has been lulled to sleep during this scene, awakens and runs about, accompanied by his nurses, and the people wish God’s blessings upon him. Then a messenger stumbles in (he has been waylaid with drink by Babarikha). His message from the Tsar is read by the scribes: the Tsaritsa and her progeny must be placed in a barrel and thrown into the sea. Reluctantly the people carry out the Tsar’s command. The Tsaritsa and her son Gvidon have landed on the island of Buyan and broken out of the barrel that they were trapped in. Gvidon has grown remarkably rapidly into a young man. In the course of searching for sustenance, Gvidon rescues a swan from being killed by a kite. The Swan-Bird in gratitude causes the city of Ledenets (Russian: Леденец) to arise magically on the island, and Gvidon is hailed by its inhabitants as its Prince. By the shore of Buyan, the merchant ships have left, and Gvidon laments his being separated from his father (Gvidon’s Act III Aria). The Swan-Bird finds a way to help him: she changes him into a bumblebee so that he can fly over the sea as a stowaway on Saltan’s ship to visit him incognito in Tmutarakan. The sailors arrive at Tmutarakan from their visit to Buyan. The sailors tell of the wonders of Gvidon’s island (the magically appearing city itself, a magic squirrel, and the thirty-three bogatyrs from the sea), but the two older sisters try to stop them from creating any interest in Saltan’s visiting the island; Gvidon stings each of the sisters in the brow. Babarikha then tries to trump the sailors by speaking of a fabulous Princess on the sea, to which Gvidon stings her in the eye and blinds her. Saltan decides to visit the island, but, in view of the havoc caused by the bumblebee, forbids that breed of insect from ever entering the palace again. Gvidon, again by the seashore of Buyan, longs for a bride. The Swan-Bird appears. Gvidon tells her of the Princess that he heard about at Tmutarakan, and the Swan-Bird transforms into that very Princess. His mother and a chorus of maidens enter and bless the prospect of their wedding. 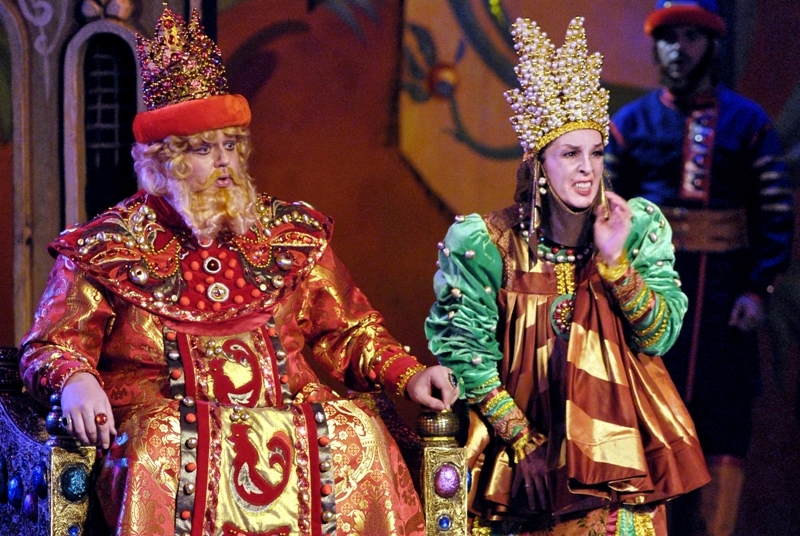 This entry was posted in OPera and tagged Kiev, Nikolai Rimsky-Korsakov, The Tale of Tsar Saltan, Ukranian National Opera. Bookmark the permalink.